Seven Dwarves as psychological aspects. For the sake of convenience I’m going to ignore a great deal of what is in Snow White but if you are interested the piece is filled to the brim with great material to work with. Really I just wanted to give an example of the type of work that can be done with pop culture tropes. I actually think I bit off more than I could chew due to this stories much longer history as a folk tale. I’m going to look at the primary characters of Snow White and the Seven Dwarfs as a psychological model. The Seven Dwarfs are components of a human bioregulating nervous system and brain. Happy is the positive emotions, Grumpy the negative, Sleepy is the sleep-wake and other cycles, Sneezy is the body’s health monitor, Bashful is the social emotions, Dopey is prelinguistic playfulness and, finally, Doc is the directing intelligence. The person represented by this is unique, someone else might have had a Mopey instead of a Grumpy and a Flirty instead of a Bashful. And while this person is able to feed, clothe, and make it to and from work, a look at their cottage/mind tells you they don’t have it all together. Then Snow White enters the scene. Snow White is Royalty, comes from the castle and can communicate to the animals. Put simply she is the Soul or in Jungian terms the Anima. At first the Dwarfs are resistant to this new influence on their lives but before long they are cleaned up and ship shape, and generally working together better then ever before. She gives them a reason for being, a purpose. More later when I talk about the Queen and the Prince… and at least one way to work with this for self-change. Sorry to hassle you here but I don’t know what else to do. I see you’re posting here regularly. Can Barbelith PLEASE have its book back? PLEASE, PLEASE, PLEASE? I bow down humbly in the presence of such gnreatess. The snow white story deals with the kabbalistic anthropology of male/female interaction. The seven lower (primitive) emanations of the male psychy and the female figure also features in the Bible books of Revelation (chapter 17) as the whore who sits on the seven headed scarlet beast. At the opening of the musical film ‘The Wiz’ we see a wall painting of a woman holding the hands of seven children. The seven refers to the ‘tachtonot’ of the sefirah and it basically explains that a man needs to become inspired by beauty, passion and honour in order to become motivated to develope his intellectual and spiritual potential. 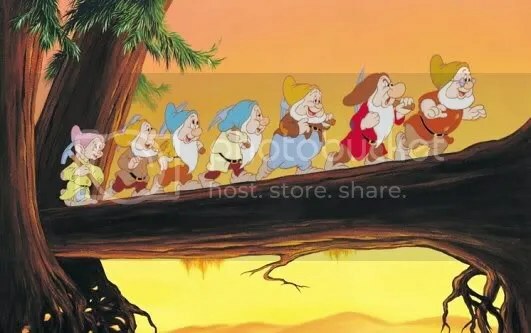 The prince that awakens Snow White at the end of the film is an incarnation of the seven dwarfs, a mature male with personality and intellect. If you look at the human brain you could say that the seven dwarfs make up the limbic system (raw emotions) and that the prince is the pre-frontal cortex (executive system). The wich is also an incarnation (alter ego) of Snow White who loses her juvinile innocense/beauty using her adquired influence to make bad ‘wishes’ in life. Here we see the Genesis story repeated, the woman gains influence and the man is faced with the challenge to stay true to his own perception rather than sacrifising his identity in aiming at merely pleasing his wife. It is a perfect ‘dance of life’ between man and woman and their attempt to escape the self distructive emotional and intellectual forces that slumber in each one of us. It is the male psychy that is brought to life by a woman, he sees the beauty in the woman that the woman is unaware of herself so that when she enters into an identity crisis she can always find her true self in the eyes of her husband. A MAN’S IDENTITY IS BORN OF A WOMAN BUT A WOMAN’S IDENTITY IS REVIVED INTO THE IMAGE OF A MAN’S PERCEPTION. ROFLMAO! You raelly need to write books, you could have everyone ROLLIN'!!! Love it!